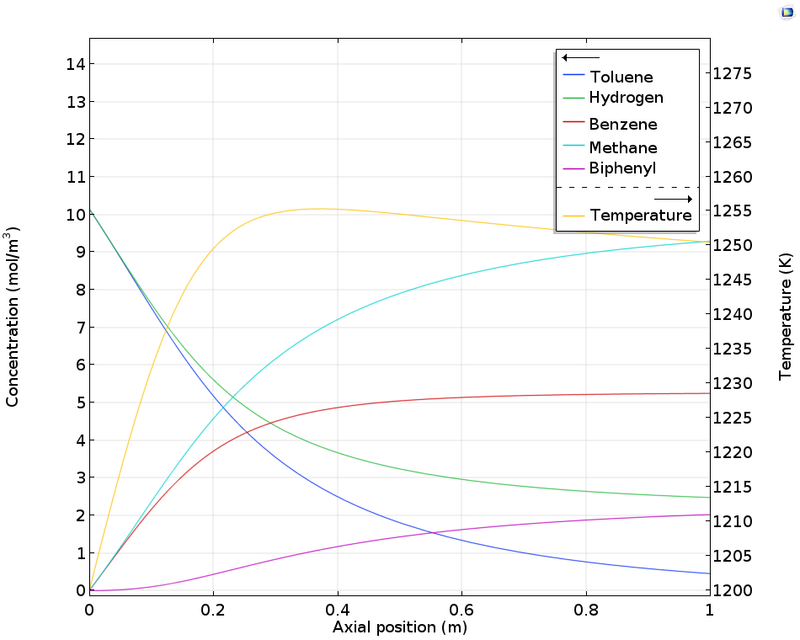 You can easily describe composition- and temperature-dependent fluid properties using the thermodynamic properties database, available as of version 5.3a of the COMSOL Multiphysics® software. For reacting systems, the database computes enthalpy of formation and enthalpy of reaction. For fluid flow and heat and mass transfer, the database can compute viscosity, density, heat capacity, thermal conductivity, and diffusivity of liquids and gases. For systems with several phases, the thermodynamic properties database computes the composition of the phases at equilibrium. Gas and liquid solutions that consist of mixtures of chemical compounds (species) have properties that depend on both composition and temperature. We need accurate descriptions of these properties to solve fluid flow problems with heat and mass transfer as well as reacting flow problems. These descriptions are based on thermodynamic models for properties such as heat of reaction, heat of formation, heat capacity, viscosity, density, thermal conductivity, and diffusivity. This model shows how the composition of a coolant mixture affects the boiling point, density, viscosity, thermal conductivity, and heat capacity of an internal combustion engine. For systems consisting of several phases, thermodynamic models are able to describe the composition of the phases at equilibrium. For example, for flash calculations, thermodynamic models can compute the composition of a liquid mixture at equilibrium with its vapor phase. 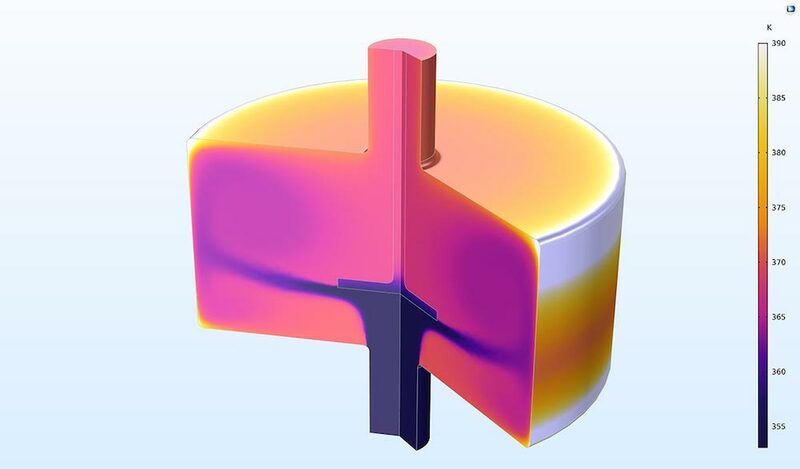 The Chemical Reaction Engineering Module as of COMSOL® software version 5.3a contains a new thermodynamic properties database with parameters and functions for a vast range of thermodynamic models and properties. We are going to explore the functionality in the new thermodynamic properties database using three different examples. The first example deals with the calculation of fluid properties for nonisothermal flow. The second example is a model of a tubular reactor, where in addition to transport properties, chemical reactions are also taken into account. The last example studies a distillation process, where the thermodynamic properties database is used to calculate the liquid-vapor equilibrium (flash calculations), including condensation and evaporation. The first example is a model of conjugate heat transfer in a four-cylinder combustion engine. In cold climates, the coolant liquid that flows inside the channels in the engine block is a mixture of glycol and water. Temperature in the cooling channels inside the engine block in a four-cylinder engine. The properties of the coolant — such as heat capacity, thermal conductivity, density, and viscosity — depend on the composition of the mixture and on temperature. In this case, the thermodynamic model is the UNIFAC VLE. An ideal model is used for the thermal conductivity of the mixture. The plot below shows the thermal conductivity as a function of the mole fraction of glycol in the mixture and of temperature. We can see that the thermal conductivity for a mixture of a mole fraction of glycol of 0.1 is 25–30% larger than that of a mixture of 0.5 mole fraction of glycol at any given temperature. The variations in thermal conductivity from -10°C over a range of 110°C is around 20% for any given composition (from 0.1 to 0.5 mole fraction of glycol). 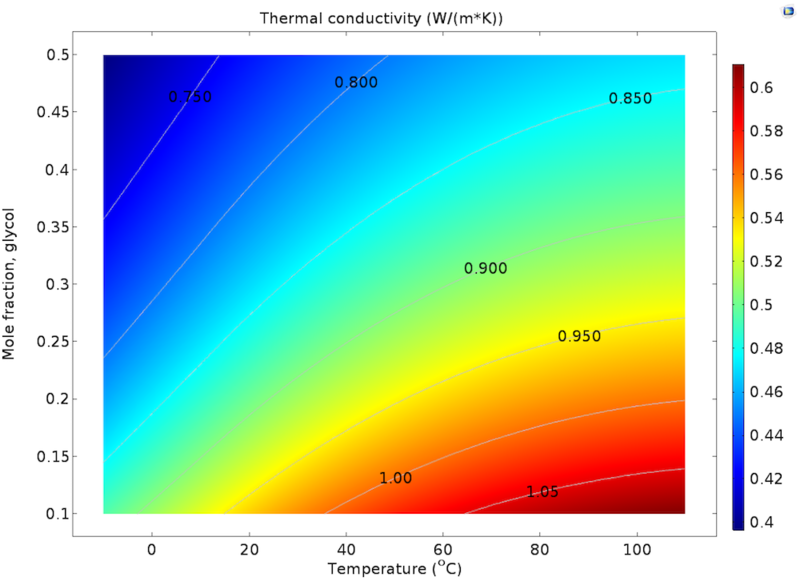 Thermal conductivity in the glycol-water mixture as a function of composition and temperature. The contour lines show values scaled by the thermal conductivity of water at 20°C. 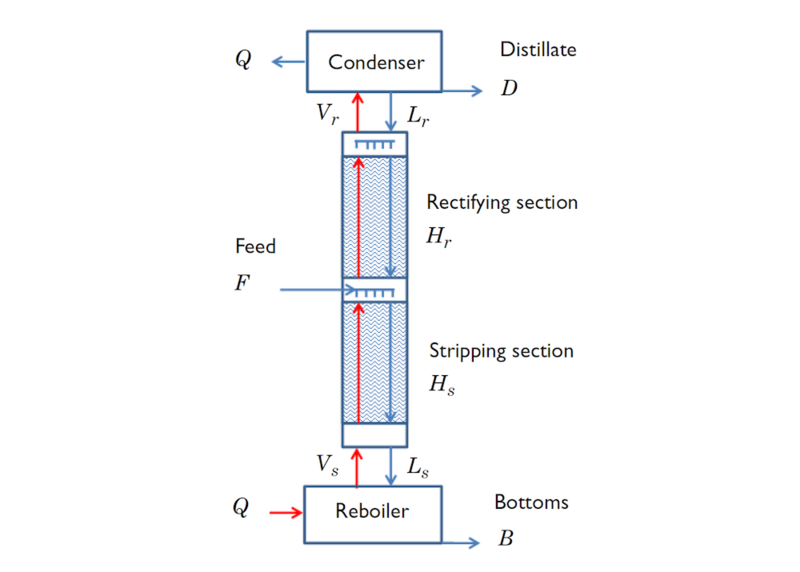 The model describes how the feed of hydrogen and the control of the temperature in the reactor can also be used to control the production of the desired product, benzene. For example, the figure below shows that after the axial position around x = 0.4, the concentration of the desired product increases to a very small extent. Most of the toluene in the remaining length of the reactor is converted to the unwanted biphenyl. Concentration and temperature in a tubular reactor for benzene production as a function of the axial position. A better yield for the desired benzene product is obtained if hydrogen is fed continuously through the reactor walls using a membrane. This is shown in the figure below, where toluene is almost completely converted with a lower production of biphenyl at the same time. Concentration and temperature in a tubular reactor for benzene production as a function of the axial position. The reactor is equipped with a hydrogen permeable membrane that, by keeping a decent hydrogen concentration, reduces the production of biphenyl. The amount of work that is required for this nonisothermal transport-reaction model would be substantial (days) without the use of the thermodynamic properties database, not to mention the time it would take to find the thermodynamic models and the data used for these models. 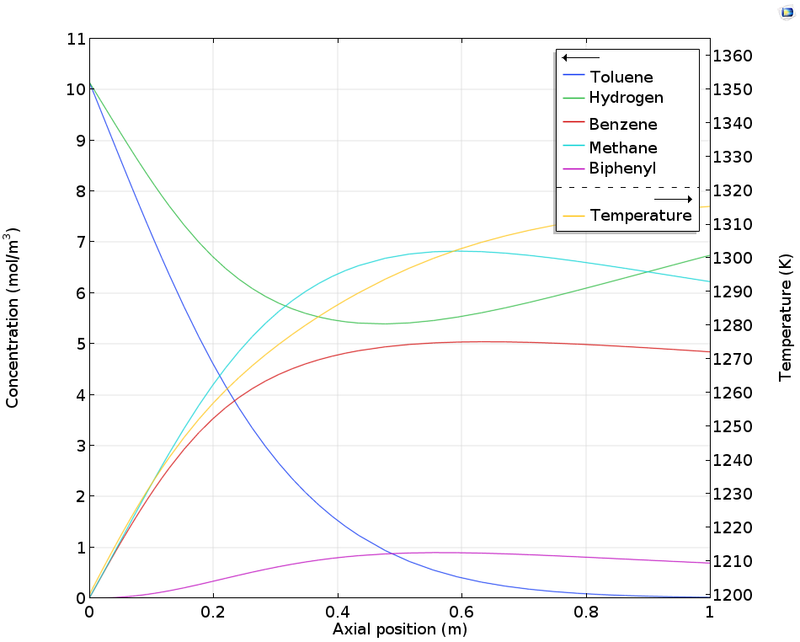 With the thermodynamic properties database, the model can be defined in a matter of minutes. The third example models a distillation column, where a liquid mixture of water and ethanol is fed into the column between the stripping and the rectifying sections. Liquid from the feed runs down the column and is heated and partially vaporized in the reboiler. Normally, some of the liquid in the reboiler is continuously removed as the bottom product. The vapor generated in the reboiler rises up toward the top of the column, where it is condensed in the condenser. Some of the condensed liquid in the condenser is normally removed as the overhead product or distillate. The remainder of the condensed liquid is sent back down the column as reflux. The distillation column where the feed is placed near the middle, while the reboiler is at the bottom and the condenser at the top. The thermodynamic model used for this example is the NRTL model. 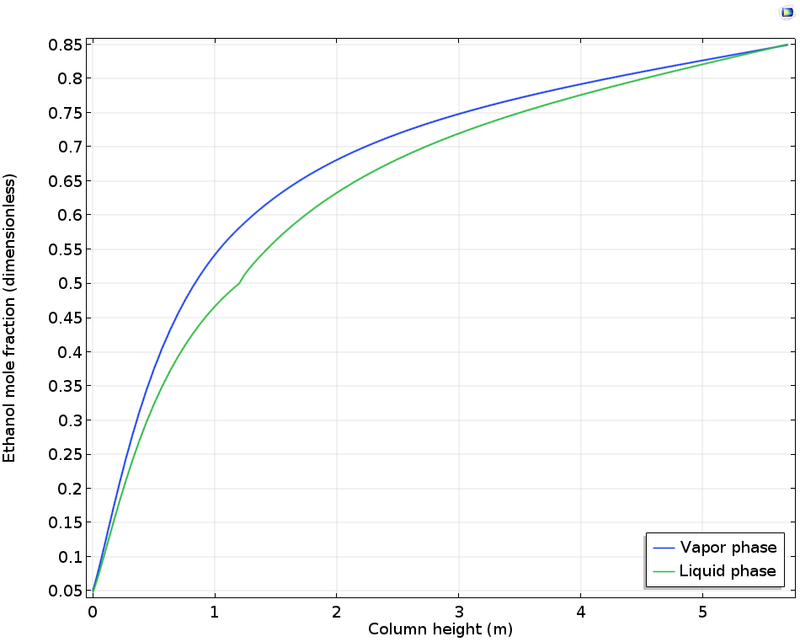 The resulting compositions of the vapor and liquid phases along the height of the column are shown below. We can see the little crinkle in the liquid phase composition curve at the position of the feed, at a distance of 1.2 m from the bottom. The curves show that we cannot obtain a separation that is above an ethanol mole fraction of 0.85; i.e., at this stage, the composition of the vapor and liquid phases are the same. Vapor and liquid phase composition as a function of the distillation column height. The thermodynamic properties database is also implemented in such a way that you can apply its functionality to existing reaction engineering models. If we already have an existing reaction engineering model, or if we decide to define an isothermal system in the first stage, which does not require the use of the thermodynamic database, we can always expand the model later to include thermodynamics. The image below shows the definition of a thermodynamic property package for the reformation of methane. In this case, the reaction engineering model is already available for an isothermal system. When we add the thermodynamic property package, we select the species that are relevant to our system; that is, we add the compounds from the database. We also select the thermodynamic model that we want to use to describe our mixture. The settings for a thermodynamic property package, with the list of selected chemical species (compounds) and the thermodynamic model for the mixture. 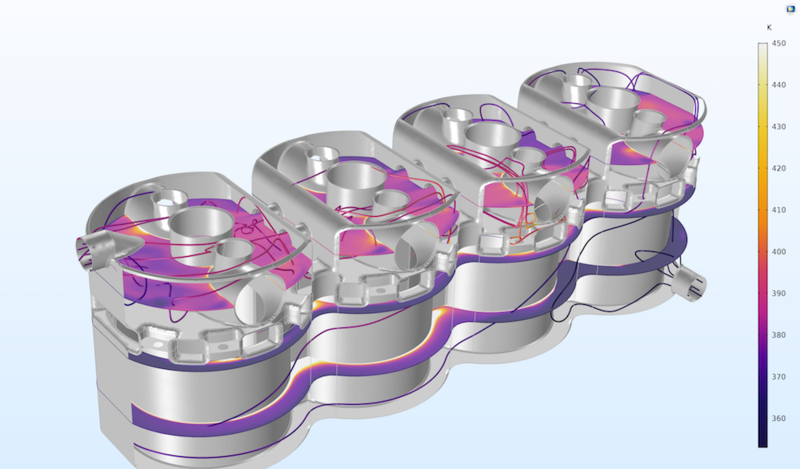 Once we have defined our thermodynamic property package, we can link it to the Reaction Engineering interface by matching the species already defined in the interface with the species defined in the thermodynamic property package. 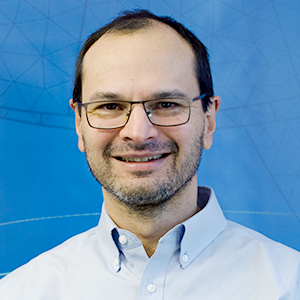 When we have defined a property package, we can match the chemical species in this package with the chemical species in an already existing reaction engineering model. Once the linking is done, the reactor model can be run for the species and energy balances with a full description of the thermodynamics and transport properties of the system originating from the database.